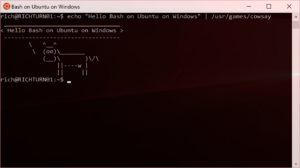 Bash on Ubuntu on Windows – Download Now! At //Build 2016, Microsoft announced the ability to run native Bash and GNU/Linux command-line tools directly on the new Windows Subsystem for Linux (WSL), coming soon to Windows 10 Anniversary Update builds. We’ve held-off giving a date until we were 100% sure it’s available … but that date is NOW! 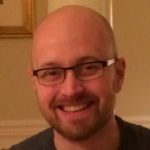 Gabe Aul has just announced the release of the Windows 10 build #14316 to the Windows Insiders Fast-Ring. 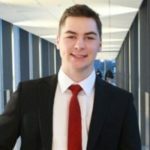 This build contains the first public release of Bash on Ubuntu on Windows and the underlying Windows Subsystem for Linux. Important: To run Bash/WSL, you must be running a 64-bit version of Windows 10 on a 64-bit PC. 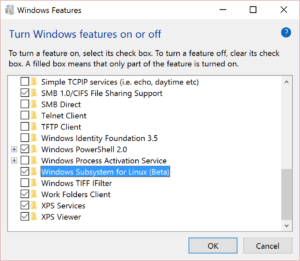 If you do NOT see “Windows Subsystem for Linux” listed in the optional features, you are likely not running a 64-bit version of Windows 10, or are running a build of Windows 10 prior to #14316.